For 6 years the Girls Rights Project has supported She Can from its start up phase sending 4 young women from Rwanda to college in the US. We visted She Can when they started their program in Cambodia and this year I was thrilled with the opportunity to go to Rwanda with She Can and help select next year’s scholars. We were in Kigali for much of the visit, interviewing extraordinary young people from diverse and difficult backgrounds. I learned about the pipeline that has been created in Rwanda to allow underprivileged girls to attend elite secondary schools where they have become prepared to apply to US universities. We met some of the scholars selected a year ago who have just been admitted to the colleges of their choice, with the help of their mentors. Rwanda is a fascinating and beautiful country. 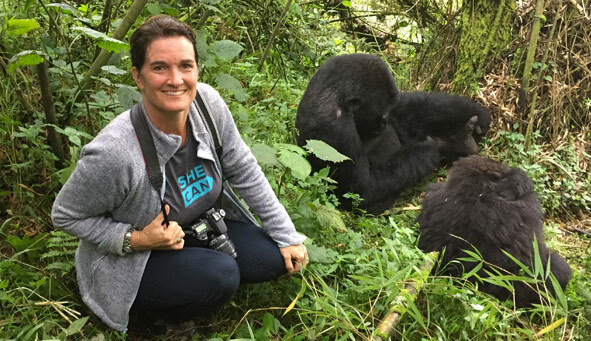 We were able to visit Lake Kivu and the Congo border crossing as well as experience the amazing Volcanos National Park and the Amhoro Family of mountain gorillas. I very much hope to return to Rwanda soon.